Slicers were introduced in Excel 2010, but then they could only be used with PivotTables. In Excel 2013 you can also use slicers with standard tables. Slicers are less flexible than the Filter Controls, but their look is more appealing visually. It is particularly useful for people who don’t work with Excel every day and filtering controls may seem to be too complicated for them. The disadvantage of this solution is that they occupy a lot of space on the screen, so it can be a problem for smaller displays. To add a Slicer, click any cell in the table. Go to DESIGN >> Tools >> Insert Slicer. The new window called Insert Slicers will appear. 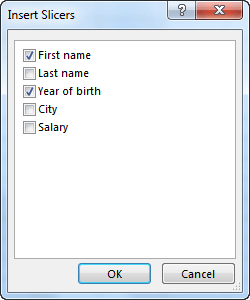 Select “Name” and “Year of birth”. As you can see, despite the fact that there are four rows in the table, you can find only three positions in each Slicer. That’s because each item refers to the unique value of the cell. The name “John”, as well as the year “1974” appear twice, so it is counted as one Slicer. Click “John” and you will see two rows containing the name. In the second Slicer, the years that are currently inside “John” rows are highlighted. If you want to select all elements of a Slicer, select the Clear Filter icon, which is located in the upper right corner.